When you see a Ferrari or a Lamborghini drive by, rarely do you think, “That’s probably fake.” Believe it or not, sometimes they are, and once again a shop in Spain is set to pay the price. 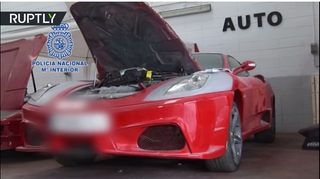 Three were arrested for making and selling counterfeit Ferraris and Lamborghinis in a secret workshop in Girona, Spain, reports local news outlet La Voz de Galicia. The cars were sold on the internet and are believed to infringe upon existing industrial property rights. In the clandestine workshop, located in Sils (Girona), the agents found 14 vehicles in different degrees of transformation - four of them Ferrari ready for sale - and in the registry were parts, distinctive elements of the affected marks, molds of glass fiber for body, odometer and documentation of the cars. In its video caption, Russia Today writes that the cars were made by molding a Lamborghini or a Ferrari body kit on a Toyota with fiberglass. Contrary to popular belief, most Lamborghinis do not have Toyota bones. Supposedly, one of the cars was put up online for €41,000, or approximately $43,000. Which is kind of expensive when you think about it! You can get a real Ferrari for that kind of money. It’ll be a Mondial, but that’s still a Ferrari. It’s unclear whether or not this shop in Girona is at all connected to the one that was busted in 2013 in Valencia.